I today, want to honor one of many women of my ancestry/relatives. Today I will focus on my great-great grandmother Annie Padgett-Rowe. When my relatives spoke of Annie, they would always say she was a “slave.” My mother recalled her being a tall, dark-skinned woman with leathery skin and being a little girl looking at her, frightened her. It wasn’t until I began researching Annie, I found she was not born a slave but most likely worked like one! After her granddaughter Annie showed me a photo of her, I could see what my mother spoke of. She was not a little woman and her hands and bones were probably thick and big due to all the hard labor. 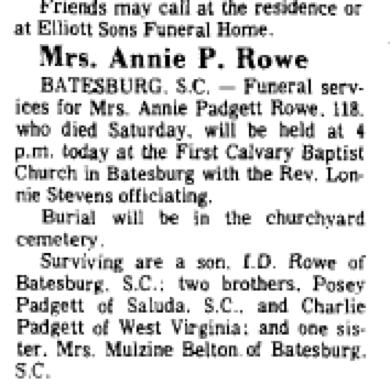 Annie Padgett-Rowe was born sometime either in the very late 1870s or early in the 1880s (each document shows a varying date) probably in Edgefield (the part that is now Germanville, Saluda County) and unfortunately, she was not 118 years old when she died (as per her obituary). I was always fascinated by knowing that she was 118 and was quickly deflated when I learned she wasn’t. Had she been then she would have been born around 1853 and therefore, would have been born into slavery. Annie’s parents were Benjamin Hall/Padgett (c 1847-1929 SC) and Amanda (c 1854 SC-). Ben’s parents were George Hall (c 1820 SC-) and Fannie (c 1830 VA-). George’s mother was Mary who was born around 1800 in Africa! 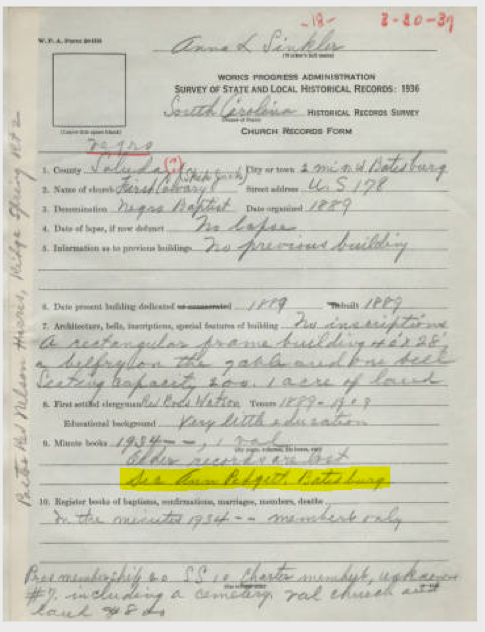 Why he changed his name from Hall to Padgett (1870 to 1880 censuses) is a mystery but according to the land they lived and toiled on, it was the white Padgett’s land and therefore, that’s most likely when the name change took place. More will have to be researched on that. 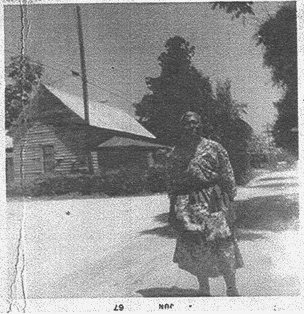 Speaking of land, Annie’s property may not have really been hers but conveyed to her son Jesse Padgett in 1946 from the well–known Lona Etheredge of Batesburg1. It was then passed through the family onto me today. Great-great grandma Annie “married” a man (no proof found) named Jesse Rowe but I believe she had children before. I am still working on her line to make things more concrete and transitional. However skeptical I am, oral history says that out of that union came my great grandfather I. D. Rowe. In speaking with an elder cousin, she told me that “Grandma Ann” as she was affectionately known, used to attend a church named “First Calvary” in Batesburg, SC. It was known by the locals as “SkipJack.” This is where she showed me all of the visible headstones of our ancestors. It later was sold and now on private property, as the church was not able to continue. Some of the headstones were broken and the cemetery was in a mess! A few years after, the homeowner had the cemetery leveled due to a rat infestation and claimed he didn’t know the stones were there. Now, I will not argue on that because the road you entered to go to his home had the visible headstones right at the edge! Anyway … the church and burial evidence of my ancestors is forever gone. Well, not really. Since she was involved in that church, I did some digging (pun intended) and found that she was interviewed in 1936 by the WPA! Oral stories had it that she was illiterate. Not so! Grandma Ann was the secretary of that SkipJack church and so had to know how to read and write! This was also confirmed on her1920 census2! I called a cousin in the area to verify this info and she said that this was indeed her! Some other hopeful data is that maybe there are enough remains of the old church and a burial ground further behind the original property that might shed some light on my ancestry. Maybe with time, resources and prayers, the inventory of that place will be gathered and documented. I want to end here to pound into your soul: allow your stories to unfold and be their own! In general, we understand that slaves were not supposed to be educated and even after emancipation, many were not. Unfortunately, there are still many today born in the 1900s and after, who have not fully been taught or grasped being literate. So yes, in general, we can comprehend that fact but in mine own direct line, my great-great grandmother was not! So find out what your lineage says even though it lives under a common cover of history. Grandma Ann died in 1971—just some years short of her making 100 years old. Sorry, I never met you but this little bit of history will remain with me and others. Because of her just being—we have her land still today! Sadly, the home she lived in had to be demolished a few years ago. Thanks for all you’ve done to make it through and with the love of God! Resting in Abraham’s bosom sure is sweet, isn’t it? By the way: Ben Padgett’s death certificate stated his mother’s name was “Fannie Hall” and underneath—“a slave”. Deed record in possession of author. “United States Census, 1920,” database with images, FamilySearch (https://familysearch.org/ark:/61903/3:1:33S7-9RNY-C66?cc=1488411&wc=QZJY-8FP%3A1036472401%2C1038420901%2C1038427601%2C1589332620 : 14 December 2015), South Carolina > Saluda > Presidence > ED 119 > image 12 of 13; citing NARA microfilm publication T625 (Washington, D.C.: National Archives and Records Administration, n.d.). South Carolina Historical Records Survey Collection (http://digital.tcl.sc.edu/cdm/ref/collection/hrs/id/2167), accessed 20 Sep 2017. Original Information: Sinkler, Anna L., Contributor. First Cavalry Baptist Church (Saluda County, S.C.), Saluda County File, in the South Carolina Historical Records Survey Collection, housed at the South Caroliniana Library, University of South Carolina. Please forgive the error in location. The current street is Duncan Street of what used to be called Saluda Street.